Tampico is a city and important port in the mexican state of Tamaulipas, located on the southernmost part of it, precisely in the Huasteca region. With a population of over 950,000 inhabitants in its metropolitan region, Greater Tampico is the most important metro region in the state and one of the most important economic and cultural hubs in the Gulf of Mexico. 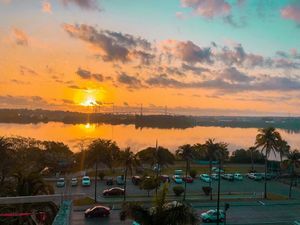 Possessing a tropical climate and being surrounded by several rivers, lagoons, wetlands and the Gulf of Mexico, Tampico has a very varied wildlife coexisting with the growing city. Tampico is served by General Francisco Javier Mina International Airport (TAM) . There is one flight per day to/from Houston via United Airlines, and several others via Monterrey, Guadalajara, Queretaro, Veracruz or Mexico City. Terminal Central de Autobuses de Tampico is the main bus terminal for the city and has several bus lines serving it. Alternately, Tampico is located a six-hour drive or bus ride from the Mexican border with either McAllen or Brownsville, Texas, as well as a two to four-hour drive or bus ride to the most iconic places of the Huasteca Potosina. Driving is the easiest way to travel around Tampico. Speed limits and red lights are enforced - other laws tend to be rather lax. Taxis are relatively safe to take in and around Tampico at any time of day or night, but as always, use caution when traveling alone. Due to conflicts with the State policy for passenger transportation, the Uber platform nor any other has arrived to Tampico, but there are several taxi lines with their own platform to use. Colonial square downtown, with nearby market, beautiful old cathedral, and very good shopping. The architecture resembles the one in New Orleans' downtown (French style). Huasteca Culture Museum (Museo de la Cultura Huasteca, INAH), Cp. Ma. Alejandrina Elias Ortiz, 833 256 8717, . Guided tours available. Daily 10am-6pm. Adults 33 pesos, students free. Laguna del Carpintero, close to downtown. A lagoon where families usually gather on weekends to relax. Crocodiles can be seen sunbathing on the shore on sunny days as well as Iguanas and turtles. Boat rides around the lagoon are available to watch the wildlife and mangroves. Sunrise at Laguna del Carpintero, with the Tampico Bridge in the background. Puente Tampico. One of Mexico's longest bridges. It connects the states of Tamaulipas and Veracruz across the Panuco River. It can be admired from the Laguna del Carpintero. Metropolitan Cultural Center (METRO), . Opened in 2004, featuring international ballet and symphony as well as national and international shows. Playa Miramar is a popular beach destination for residents of Monterrey, Mexico City and San Luis Potosí. The only certified clean beach on the Gulf of Mexico. A shallow beach with soft waves perfect for kids. Old Customs Building (Antigua Aduana Marítima de Tampico) is an emblematic building in Tampico's downtown, built during 1896 to 1902. It houses the "Battle of Tampico" museum. The Panuco River can be seen and admired from its terraces. ALTAMA City Center, opened in 2015, is Tampico's largest Shopping Mall, allocating international fashion stores and local as well as national/international food chains. Centro Comercial Tres Arcos. One of the first shopping malls in Tampico dating back to the 90's. Not as big as ALTAMA City Center but still with a varied offer of goods and services. Restaurante Don Churrasco, on the northwest corner of the main square, is a good argentinian restaurant to eat or drink a beer with a great view of the square. Restaurant El Huasteco, located half a corner away from the main square. Typical local huastec food that should not be missed. Tortas de la Barda. Typical Tampico-style lunch consisting of bread filled with several ingredients. Located just outside the Old Customs Building. Restaurant Los Curricanes. Tampico is well-known for its fresh, delicious seafood, and this restaurant is one of the best in Town. Restaurant El Asador. With several branches around Tampico, this restaurant offers typical huastecan food for breakfast and superb steaks for dinner. Huasteca Potosina. Known for its waterfalls and rivers of crystal-clear waters. Popular locations like Tamul Waterfall, Xilitla and Tamasopo are located 2.0 - 3.5 hours away. There are buses departing from Tampico's Bus Station that take you to Ciudad Valles and there you have to take another bus to these places located in the middle of the mountains, though it is easier to rent a car and get there driving. This page was last edited on 27 March 2019, at 16:18.